I arrived in Surabaya, Indonesia as night fell on December 13th. This arrival came after a long night on a bench in Bangkok’s massive airport/shopping complex, and a long day trying to figure out how to get from terminal 2 to terminal 3 in Jakarta’s airport. My first trip on the famous AirAsia Airline was an hour late, but luckily John was late as well in getting to the airport to meet me, so it all worked out in the end. We spent the night in a Surabaya suburb and then went to the bus station on the outstretches of town. Various taxi drivers saw two “bules” (the Indonesian version of gringos, in other words, white foreigners) and started shouting “Bali! Bali! Bali!” like the seagulls in Finding Nemo. We ignored the hawkers and found the bus to Ngawi, the largest town close to where John lives. John gave me a quick explanation of the “Rules of the Road” in East Java as the bus pulled away from the station: Buses rule, trucks are almost as important, then there are cars, motorbikes, and bikes, in that order of importance. Therefore, if you were to be driving a small Suzuki, for example, and noticed a bus was passing a line of buses despite the lack of distance between you and the aforementioned oncoming bus, you would pull over your Suzuki and let the bus continue to pass. “What if the bus is passing cars and there is a bus coming in the opposite direction?” I asked. John didn’t answer, but after the first hour, I realized that despite a dozen adrenaline rushes that I was about to die in a head-on bus collision, it had not happened yet, and probably would not happen for the next 3.5 hours of driving. We got off the bus at an “informal” bus stop, which means we got off the bus at an intersection. The bus was continuing straight ahead, towards Solo. Ngawi Town was on the right, and we were going to Paron, on the left. We waited at the intersection for a bit before a mini-bus came and picked us up. The bus was pretty empty, but I felt like it filled up quickly with my big backpack and large American body. We rode for a little less than 10 minutes before arriving in Paron, and then hoofing it to John’s host family’s house. In case you don’t know who John is, or don’t follow me on Twitter (where I sometimes tweet about John), John is one of my best friends. We met in 7th grade when we were both skateboarders, and have remained good friends for the past 12 years, both in our homestate of Colorado and abroad. 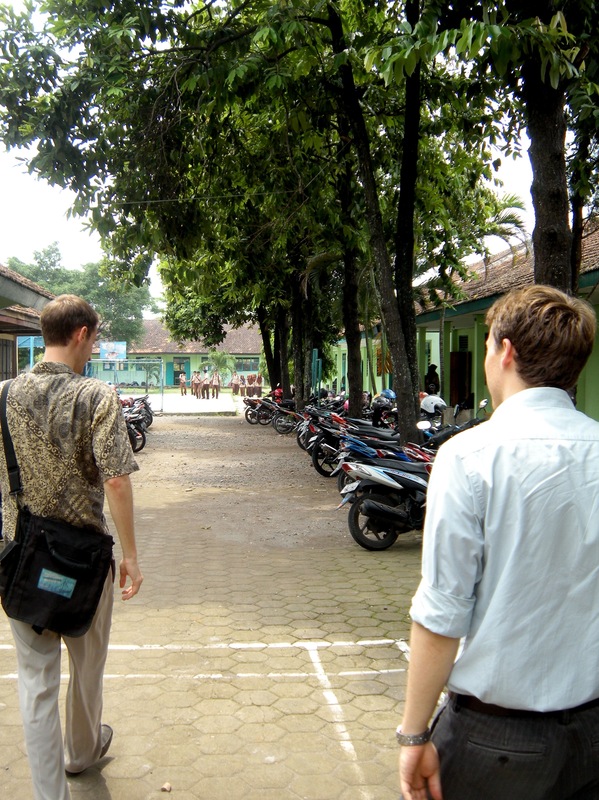 He is doing a Peace Corps post in Paron, Indonesia, teaching English at a local secondary school. He had been abroad for over two years when I finally got to see his world during this trip, and needless to say, it was awesome to see him and the amazing place he has been living. His host parents were incredibly nice, his neighbors much the same, and whenever we would go through town, people knew who he was and were very excited to see him, which made me feel like I was staying with a local rockstar (I practically was). After a rousing game of soccer (John and I versus a 12 year old and a 9 year old, and the younger team dominated), and probably one of the most delicious dinners I had eaten in months (Kazakh food is pretty lackluster relative to East Java), we called it a night. The next morning, after borrowing a neighbor’s bike, we pedaled down to John’s school. One of the funniest things about the week I spent with John in Paron was that, because he was one of the first bules to stay for an extended period of time in Paron, and had Indonesian language training with the Peace Corps before arrival, everyone assumed all bules spoke Indonesian. John taught me “mongo,” which means “Hello, please forgive me, I am going somewhere and cannot talk.” We’d be pedaling along, and pass some shopkeepers or people by the side of the road waiting for one thing or another. At first, I would keep my head down and not say anything (one thing I’ve learned to do in Kazakhstan: never bring attention to yourself). But, after a few fleeting glances, I noticed the people were looking at me inquisitively with a bit of a grin. I’d say “mongo,” with a wave, and they would burst out in laugher with gigantic smiles as they returned the greeting! It was bizarre at first, but made me feel so awesome that by the third day I would look at people we passed with a big smile and a hearty “mongo!” which would always illicit a generous, happy response (I did not revert back to my “head down, eyes forward” ways after the trip, which inadvertently lead to me being searched by the Kazakhstani police within 48 hours of arrival when I returned to Almaty). John got a few calls on his mobile on the first day, and since he was speaking in English, I ascertained that another Peace Corps Volunteer, the one geographically closest to John, was taking the hour long bus ride to Paron to meet me, exchange news and books with John, and wallop the Colorado boys in a game of P.I.G.. As John’s entire school cheered every time Daniel made a basket, John and I hardly made a shot the entire game, which only solicited depressing “awwws” from John’s students. We spent a few days kicking around John’s school during the week I spent in Paron. His students were always incredibly polite, and his coworkers were also very friendly. John co-teaches with some locals, who invited us to lunch one day. The dish of the day was known as “Chicken Foot Soup.” John, never one to give more information than necessary, told me the translation, but waited until it was served to point out that there were, in fact, two chicken feet in the bowl. I noticed quite a few people will ask you, upon finding out that you traveled to Indonesia, Malaysia, and/or Thailand, “what was the weirdest thing you ate?” For me, it was definitely Chicken Foot Soup. Don’t get me wrong, the dish was delicious, with fresh veggies and bits of chicken, but it was a little odd putting a chicken foot in my mouth, suckling the fat off it, and spitting the foot bones out. Luckily, by the time I got to the sixth toe, I felt like a natural. The other thing I noticed is that John no longer kept his hair long. I had given up neck-length hair during my freshman year of college, but John rocked it long into college. However, he looked more “professional” in Indonesia. I found out he gets his hair cut for the price of 50¢ USD in a small shack on the side of the road. Needing a haircut myself, I followed him to such a price saving trim. With John’s translation skills, I got a better haircut than I did in Montana just before my brother’s wedding back in October 2012, and at 2.5% of the price! The price surprised me too! John was able to show me around quite a bit of East Java away from Paron, but the people, food, and time spent in his home was undoubtedly the coolest part of my entire three week trip. This is a panorama just a few steps from John’s host family’s house. Click on it for an interactive verison.